Back in February I wrote about Ethan Saylor; a 26 year old man with Down syndrome who was murdered by police over a 12 dollar movie ticket. Ethan Robert Saylor went to watch a screening of “Zero Dark Thirty,” and after the movie was finished briefly left the theater before walking back into the theater to watch the movie a second time. The manager called three off duty police offers who were working as mall security guards to come and remove Ethan. The three officers quickly stormed in the dark theater screaming for Ethan to get out of his seat (which I’m guessing terrified him; he wasn’t sure what was going on, or who these men were yelling at him. Remember Ethan has Down syndrome which is a mental disability, and there’s a good chance he didn’t understand he was breaking a rule by entering that theater a second time.) He had no context who these three men were screaming at him in the dark theater. While all of this was going on, Ethan’s aide (caretaker) had arrived at theater to pick him up from the first showing, and tried to explain to the police officers that Ethan has a mental disability and to allow her to get Ethan out of the theater. Her pleas were ignored, and the deputies forcefully pulled Ethan out of his seat, forced him to the ground, and handcuffed him. He was terrified. In fact, witnesses described hearing Ethan crying and calling out for his mom. The three police officer struggled with Ethan and held him down on the ground at the bottom of a 3 man dog-pile him so hard and so long that they fractured the cartilage in Ethan’s throat (usually the result of manual strangulation) and choked him to the point he he stopped breathing and went into cardiac arrest. Within minutes Ethan Robert Saylor was dead. Three police offers working as mall security guards choked a 26 year old man with Down syndrome to death on a Saturday afternoon over a misunderstanding involving a ten dollar movie ticket. Ethan’s death was ruled a homicide by asphyxiation, but the grand jury failed to indict the officers involved and they were allowed to return to duty without any consequences. Ethan’s family has a lot of questions. After the police who murdered Ethan were cleared of all charges (even though his death was ruled a homicide) Ethan’s family turned to the power of social media to help them find some justice. They created a website telling their story. They started a hashtag (#JusticeForEthan) and asked people to tweet out specific quotes and a link to their site using the hashtag. Bloggers got behind it. And now they are harnessing the power of social media to help open up an independent investigation into Ethan’s death. Ethan’s family has created a Charge.org petition, which as of today has 320,000 signatures calling for their Governor (Martin O’Malley) to conduct an independent investigation into Saylor’s death and for proper training for police. Part of the problem is that police officers in Maryland aren’t trained enough in how to deal with developmentally disabled people like my brother. I think training is an important next step in making sure that what happens to my brother never happens to anyone else. We need a comprehensive, independent investigation that will show all sides of the truth; unbiased and thorough. I want my governor and attorney general to get justice for my brother, and to implement training protocols so that no other family will ever have to experience the pain my family feels. I love seeing so many people banning together and leveraging their social networks to make sure this story isn’t forgotten. Will You Please Sign The Petition? This blog, and our related social media accounts, has developed into a rather large platform over the course of the last several years. So large in fact we think together we (this means you!) can help the Saylor’s get the rest of the signatures their petition needs. I could write all night about why this matters, but here’s the very short answer: Noah’s going to grow up to be a 26 year old man with Down syndrome one day (God willing.) There will be times when Noah doesn’t understand something and there will be times when people don’t understand him. I’m not omnipresent so I can’t always be there to protect him. I also want Noah to be able to be as independent as he can. I want him to hang out with his friends. To go to high school football games. To the mall. To the movies. To do some of the typical stuff that we all do…without worrying about him being hurt (or murdered!) by three over zealous police officers who want to be tough guys. As I’ve said before things have to change. This has to stop. Signing a petition won’t stop it. Only God changing the hearts of people will. By signing the petition you are helping stories like this stay in the public eye. You’re helping to bring accountability to those you need it. You’re helping to provide training so that hopefully when my son (or yours) misunderstands the rules at a movie theater he won’t end up on the ground under three grown man and choked to death. Signing the petition won’t make everything better, but it ‘ll help. Ethan was someone’s son. Someone’s brother. Someone’s friend. He was created in the image of God, and God loves him. His family family loved him. He was a human being worthy of respect and dignity. My mind keeps trying to reply the day Ethan died. I can’t even imagine how heart breaking that scene must have been. Ethan crying out for his mom, terrified as three strangers burst into a dark movie theater screaming and yelling, threw Ethan to the ground and put their hands around his neck so hard he couldn’t breath. Ethan’s aide screaming for the three police officers to ‘PLEASE STOP!” The young movie theater employees that called the police snickering outside the theater about the “weird guy who is getting arrested for sneaking into the movie theater.” The people sitting in that dark theater watching and listening to all of this; scared to speak up because they didn’t want the same thing to happen to them. Those three cops treating Ethan with no dignity. Beating him up. Not caring that they were about to take the life of a son who would no longer be coming home to his parents. And then there’s Ethan’s parents. I can’t even imagine how they must have felt when that got that call. When they learned the details that their son died at the hands of the very people whose job it is to serve and protect us. When they found out their son’s death was a homicide, that he was choked to death. And then when they found out that the tree men who murdered their son were cleared of any wrong doing (by the local sheriff’s department who certainly wasn’t unbiased) and allowed to go back to work like the whole thing had never happened. It literately makes me sick. It makes me sick that it could happen to my son. That it could happen to your son. I’m thankful that even though we live in a world filled of evil, God still holds the whole world in His hands, and we can trust Him. I hope you’ll take a few minutes to sign the petition and help Ethan’s family get the number of signatures they need to open up an independent investigation regarding their son’s death. But as I mentioned, that won’t fix the real problem. Only God can truly provide the remedy we’re really looking for. So I pray tonight. For my son. For Ethan’s family. For our world to come to see all people as people created in the Image of God and deserving of love.it. I hope you’ll pray with me. P.S. Check out this video…. I have a 13 year old with Downs and I also have a degree in Criminal Justice and not having knowledge is a stupid reason for this happening-it is called come sense and these cops failed to have that. Rookie officers who were trying to be like the hero from Mall Cop-Paul Blart. No officers were charged with murder in this case. As a special needs teacher, this upsets me too much to even comment… I will let others speak more eloquently, as I am too stunned here. I have a son with Down Syndrome and this story made me cry when I first heard about it although I think there is a lot more to the story. I started reading this article and stopped myself when I got to the line “Remember Ethan has Down syndrome which is a mental disability”. I don’t agree that Down Syndrome is a mental disability! intellectual delay, low muscle tune which in turn causes low motor skills with handling objects and delayed speech, but mental NO!. Also Jean said “I have a 13 year old with Downs” I have never heard the term Downs used by a parent of a child with Down Syndrome from my community here in Australia. Thanks so much for your comment. I am very sensitive to the words I use, and can understand you not liking the term “mental disability” since it seems to communicate something negative, but one of the characteristics Down syndrome is a cognitive disability. Now I use that term in the same way the medical community does. I prefer the term “differently abled.” But the truth of the matter is that someone with Down syndrome typically has a more difficult time when things that someone without Down syndrome. That isn’t being disrespectful, it’s just being honest. What I meant in my post is that Ethan very well may not have understood that what he was doing was wrong, and this may very well be the case. I am an RN and I had a sister with Down’s Syndrome. (She recently passed away.) The term “mental disability” is a psychiatric term. The proper term is “development delay” which means that although he is 26, he has the intellect and cognitive capability of someone much younger. However, what you said about him probably not understanding is true. I have heard many parents shorten Down’s Syndrome to just Down’s and everyone knows what they mean. I think Ken is being overly critical. He said he stopped reading the article, yet he saw fit to comment about it. Instead of overlooking the minor imperfections he chose to pick apart the article and comment on the article he did not finish reading! I have a step-son with Down Syndrome. My husband refers to him as developmentally disabled. I too am Australian and have a son with Down Syndrome. Yes, it does take some getting used to hearing other countries’ description of DS. We use “Down Syndrome” instead of ‘Down’s’, and “intellectually disabled” instead of ‘mentally handicapped’, and I do feel more comfortable with our terms. But none of those labels really matter – when we talk about justice, when we are distressed about what happened to Ethan, and worry about what might happen to ours and others’ disabled children. I was shocked when I read about Ethan, and cried. I am still reeling. Yes, having DS doesn’t necessarily mean a person is disabled; I know of a lawyer in Melbourne with DS, and a policeman in Adelaide with DS. However, the majority of children with DS do have significant cognitive impairment and developmental delay. I have to point out in response to what Ken said that my son is actually significantly more disabled than the majority with DS, so I would find it strange for anyone to say he wasn’t disabled. But that doesn’t matter either. What matters is that what happened to Ethan never happens again either to my child or anybody else’s child. I have a son who has a server learning disability. He is also is adhd. He is a twin I pray everyday that God gives him strength to take on this world. I know how it feels when your child is look at funny when they are not sure on what they should do. They can’t help they are they are that more precious to me. The day he was born was most wonderful day ever. He is a great son. And a great boy to hangout with. I am not a parent or guardian, but I CAN say is that I have a few friends that have Down Syndrome. This story is very sad that it almost made me sob. Anyway, with that being said, Down Syndrome people should be treated equal as anyone else in this world. As a parent of a child with DS I am more upset at how the NDSS has been quite. You would think they would stand up with a loud voice instead they cower. Our society accepts hatred towards special needs but goes all in for the likes of Trayvons and others. Breaking down doors is what we have to do not sit on our hands like the NDSS. 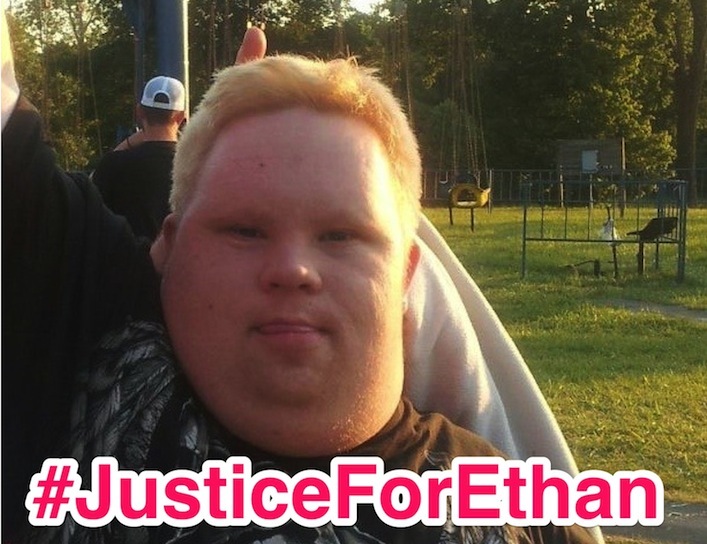 God will do justice for Ethan, I feel like those “police” should be having their cartilage of their throat Broken, and asfixiate them , but God will take care of them, meantime, please PUNISH those bastards, PLEASE!!!!! I have a 17 year old son with Down Syndrome who loves to go to the movies and idolizes the police. This story really scares me to death. My heart goes out to this family and I hope that my child never has to face something like this in his life. We’re the off duty police officers charged and found guilty of murder? I talked about that in the post. That’s why we are trying to get justice for Ethan by opening up an independent investigation. The officers were cleared of any wrong doing, although Ethan’s death was ruled a homicide. We were told the Department of Justice is investigating Ethan’s death…..what gives? So disgusting to read. This is a very sad story to say the least. Something has to be done. I agree! Did you sign the petition, and share it across your social networks? That will help! I have a down syndrome son who means the world to our family. these individuals are a gift from god. someday the officers that did this will face a greater power than our justice system for what they did. Is there a way to get the names of the officers? Lt. Scott Jewell, Sgt. Richard Rochford, Deputy 1st Class James Harris. I have cerebral palsy. When I was about to be “mainstreamed” (start going to a “regular” school, instead of a “special” school for kids with disabilities), my classmates and I created a short film to show to the students at our new schools. It was called “Why Can’t We Be Friends”, and included some basic disability awareness information. It was aimed at kids who were our ages and included some popular music. (Why Can’t We Be Friends was the name of a popular song). After showing it, we would answer questions about our lives and our disabilities. It was very helpful. We felt much more accepted after our presentations. I wonder if something similar would help other kids understand Noah’s disability. This wouldn’t solve the immediate problem, but Noah’s peers will grow up to be our Police Officers, etc.. It would also be helpful to Noah in his present life. Did you go to UC Davis? Hi, Rick! I just read your article post today. And I was ashamed those officers going back to their work. Placing him in a wrong situation could really do harm for everyone. I’m 32 and also has Down syndrome. I may be not as look like him, but I have mosaic. Mosaic has two normal copies of chromosomes and the extra copy has abnormalities of Down syndrome. On my part, I should do the right thing you are doing now. I’m also in sensitive side of issues when I’ve finally accepted of who I am. This is sad. I just had a baby sister with DS and I love her to death and I hope though she has DS that she will grow up to be higher functioning. I saw a video with your son having socks on his hands to help with fine motor skills ( grasping his food with two fingers) I’m going to have to tell my mom about that so that we could teach Emma someday! And using a toothbrush to learn how to eat! thanks for those useful tips. I have a three-year-old son who has down syndrome. i am also a police officer. There is nothing that can be said to ease the pain of what Has happened in this case. The only thing that I will say is that for every three individuals who handle a situation badly There are 300 police officers that will give their lives to protect everyone equally. I love my boy more than anyone. I am sorry for the loss. Hug Your loved ones and tell them you love them because you never know When your time or their time is up. It is really very sad and unfortunate that without any reason you have lost your son. One of my best friends is also struggling with Down syndrome. I understand how tough it would be to express, to talk, to understand the others. Don’t lose hope, we are here with you. Leena, Thanks for your comment, but did you read the blog post? I didn’t loose my son.